Children, youngsters and also adults have already got accustomed to helmets and joint protectors in many kinds of sport. A gumshield should also belong to sports equipment as a matter of course. 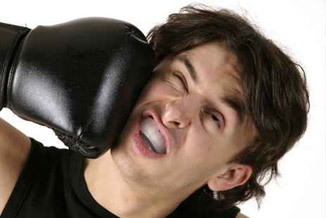 According to different studies up to 40% of all tooth and mouth injuries are sports related. With a gumshield painful and irreparable injuries can be significantly reduced. Even concussion is reduced, because the gumshield absorbs the forces that affect the mouth and teeth. A gumshield is essential with martial arts in particular. However, optimal protection can only be ensured if the gumshield fits exactly over the teeth and cannot move. 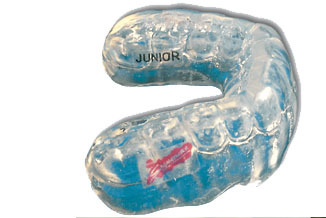 Depending upon the kind of sport and your age we can offer you different Signature® Mouthguard models. The gumshield is tailored individually to your personal needs. If you box, do karate or judo, a soft insert improves shock absorbtion. For hockey or ice hockey there are special models with hard front tooth protection. Many different colours and colour combinations are possible. Sport clubs can combine colours individually, so that the gumshield matches the club colours. Hightech materials and a special manufacturing process create such a perfect fit that you can speak, drink and breathe problem-free while wearing the gumshield. Please talk to us. We will gladly advise you.